Visit the Juicy Studio website at: https://juicystudio.com and select Quality Assurance from the navigation available on the right side of the page. 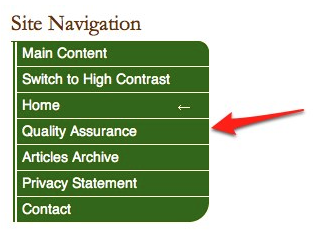 Scroll down on the Quality Assurance page and select Readability Test. Enter the web address of your website in the URI field and choose Calculate Readability. Gunning Fog and Flesch-Kincaid Grade: these two algorithms are rough estimates of the number of years of schooling that would be required to understand the content on the website. The recommended range for these two scores is between 6 and 8. Flesch Reading Ease: rates the text on a 100-point scale. The higher the score, the easier it is to understand the document. Authors are encouraged to aim for a score of approximately 60 to 70.